Well, I wasn't planning to do this today, but I found we had some time on our hands so we drove to the farmstand where they sell the B-grade cucumbers and peaches. I bought a half-bushel of odd-sized pickling cucumbers (the freestone peaches will be ready next month, they say) and got home and started to work. I usually make Kosher-style dill spears, from the recipe in The American Family Cookbook. This time I made the same recipe but in slices. I still have 8 quarts of spears from last year, after all. The recipe calls for cider vinegar, water, salt, garlic, dill seed, and peppercorns. It's quite easy. 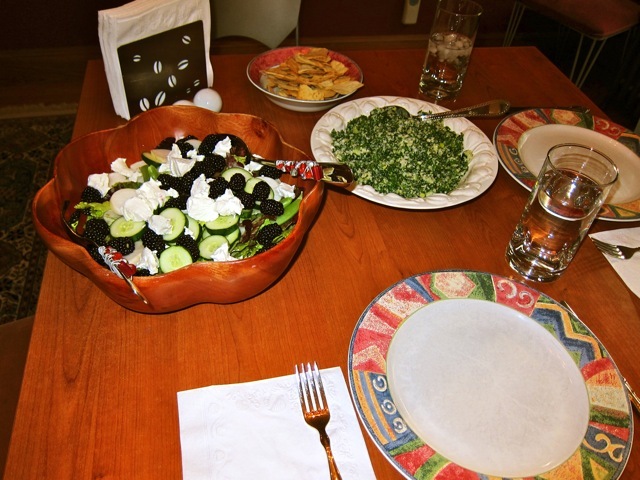 The garlic was from the farm share so was fresh and pungent. Mmm! I ended up with 5 quarts of the Kosher slices and one quart has already gone to my parents. In addition I tackled the green and wax beans from the farm share, with 4 peppers from my garden, one farm share onion and one regular, store-bought, one, some celery and some edamame. I couldn't find fresh lima or fava beans so I thought I'd try the edamame instead. The 3-bean salad isn't that colorful because the peppers were green, not red, but it's a great recipe (Ball Complete Book of Home Preserving) and I don't really care what it looks like! This is also the first time in a while that I didn't add beets. Haven't gotten any from the share yet. I made 7 pints and for that I had to add an extra half-recipe of the liquid to fill all the jars. Now I can get to work on dinner! Yesterday, in 100 degree weather, I picked up the share. I was smart, and brought a jug of water to put the flowers in. This week it was 65 stems of flowers, zucchini, eggplant, cabbage, chard, kohlrabi, garlic, onions, potatoes, carrots, more green and wax beans, cherry tomatoes, basil, and cilantro. We split everything except Stephanie got the chard, tomatoes and the basil and I got the cabbage, beans and the cilantro. The tilapia was soaked briefly in 3 c. ice water and drained. The onions were soaked in another 2 c. ice water and drained. These 2 ingredients were mixed with the habaneros, lemon and lime juices and salt. After about 15 minutes it was ready to serve. The ceviche went really well with the corn salad, and I didn't have to turn the stove on at all! 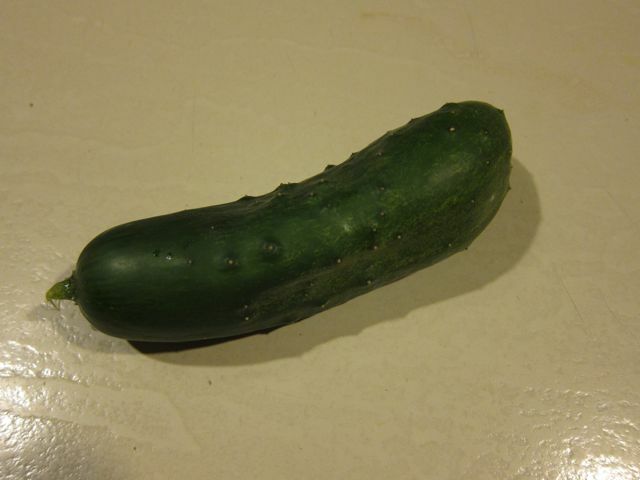 The current tally for my rooftop garden is: 9 cucumbers and 1 bell pepper. There are about 10 more peppers about to be ready, and maybe 3-4 more cucumbers right now, and a whole lot of tomatoes trying to ripen. Which should happen quickly as long as it stays so hot. 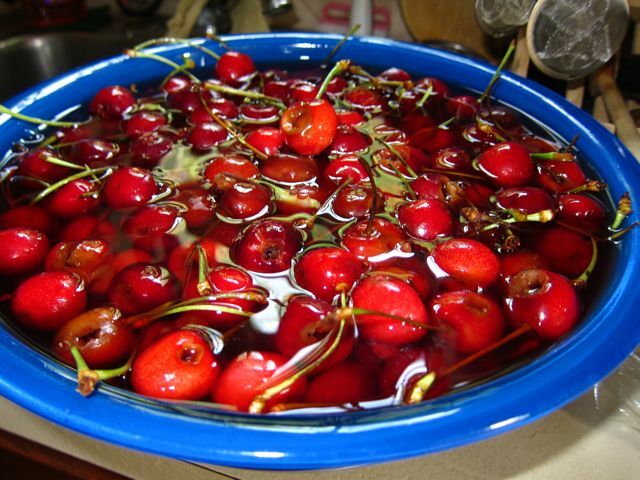 Well, I know that some of these cherries will be used to flavor Brandy Manhattans, and others most certainly will garnish ice cream! 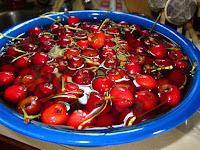 This morning I drained the cherries again, reboiled the syrup and added the almond extract. 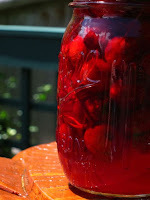 The stems certainly add volume as instead of just under 4 pints, the same recipe produced 5.5 pints of cherries. They also increase the difficulty factor because those stems just didn't want to stay out of the way when I was trying to get the lids on. They were processed for 20 minutes and then I let them rest in the canner for 5 before I pulled them out. Didn't want a repeat of the siphoning which plagued the spiced apples. And now, since it's such a gorgeous day, I'm going for a walk. Cherries were on sale! 'Nuff said. No, really. They were $1.99 a pound. How could I pass that up? And we were down to 2 jars of maraschinos from last year. I asked my husband if he wanted me to make another batch and he said, "Well, then maybe these ones won't be so dear and I'll actually eat them." How sweet, he was saving them for a special occasion! Yesterday I pitted them, all 4.5 pounds of them, sideways. I wanted to leave the stems on this time, and with a little patience it is possible to pit them sideways. They look somewhat Magritte-like in that you can see right through the hole in their middles. Some had really crisp edges, too, which also made me think of Magritte. Surrealist cherries! They finished their brine soak this morning and are currently in the red syrup. Tomorrow they get strained, the syrup gets boiled and the almond extract (the real stuff this time, purchased at Penzey's) will be added, then they will get put up in jars. Should get about 4 pints again. I don't know if I'll save the extra syrup this time; we don't really use the other batch all that much - too sweet for pancakes or waffles. Two years ago, while visiting my in-laws, I had a challenging time making black raspberry jam in their kitchen. The problem was a lack of equipment and being unfamiliar with the dynamics of the kitchen (the work triangle, I guess. I learned about that while contemplating redoing my kitchen). Anyhow, I am either brave or foolish: I decided to try again. But I can be taught. Before I got started, I bought a canning rack, jar grabber, and a funnel! I was prepared! This morning my father-in-law, my husband and I went out to pick black raspberries. We picked about 8 pounds, which is enough for two batches of jam and a bunch for eating. One batch was the standard Certo recipe (8 jars) and the other was the same recipe but with lime juice and lime zest (9 jars). I really like how the lime one turned out. It's a nice combination of flavors.